The number of federal employees who telework has doubled since 2001, but lawmakers and managers still face significant challenges as they try to encourage workers to ditch the highway commute for a walk down the hallway. According to a recent survey of 78 agencies by the Office of Personnel Management, only 9.5 percent of the more than 1.2 million federal employees who were eligible in 2005 to work from an alternative site did so at least once a month. Management resistance and organizational culture ranked after office coverage — having enough people in the office to handle matters that arise — as the second and third biggest obstacles to federal telework. OPM released its report at a time of growing pressure from members of Congress for federal agencies to expand their telework programs. Telework advocates on Capitol Hill say telework reduces vehicle emissions, improves employee recruitment and retention, and prepares agencies for emergencies by dispersing employees and technology as part of continuity-of-operations planning. Congress mandated in 2000 that each executive branch agency establish a comprehensive and inclusive telework policy, but the results have disappointed lawmakers. “I don’t sense that, overall, agencies have concentrated on the concept of telework,” Sen. Ted Stevens (R-Alaska), said at a June 12 hearing on telework held by the Homeland Security and Governmental Affairs Committee’s Oversight of Government Management, the Federal Workforce and the District of Columbia Subcommittee. Stevens is one sponsor of the bipartisan Telework Enhancement Act of 2007, introduced in March. The bill would establish the position of managing officer for telework at each federal agency and mandate productivity awards for teleworkers. Meanwhile, there is widespread agreement that improving management at the agency level is crucial to building successful telework programs. By law, each agency must develop a telework policy to best accomplish its goals. “Agencies need to have meaningful measures of what they are trying to achieve through telework, and they need to be using this information to achieve their results,” Bernice Steinhardt, the Government Accountability Office’s director of strategic issues, testified at the June 12 session. In 2003, GAO suggested that agencies track measurable goals and create a business case for their telework programs. However, GAO said those guidelines have been among the least-followed as agencies have moved forward with their programs. In a 2005 study, GAO also found that agencies’ measurements and eligibility requirements for participating in federal telework programs were inconsistent. An existing legal framework authorizes the General Services Administration and OPM to take the lead in establishing and overseeing the governmentwide telework program. Meanwhile, developments at the U.S. Patent and Trademark Office have gotten the attention of telework proponents. Jon Dudas, the agency’s director and undersecretary of Commerce for intellectual property, said USPTO has tracked its employees who telework and found they are as productive as those who work from 9 to 5 in the agency’s offices. USPTO provides training for managers who supervise teleworkers and for those managers who telework themselves, said Dudas, who spoke at the June 12 hearing. The agency has test programs under way in which entire units, including managers, are teleworking, he said. Part of the training involves learning how to create appropriate employee performance measures. “It’s learning how to communicate — training [managers] to better communicate in a telework environment — and helping them understand how to set the right performance metrics to ensure that employees are successful,” said Vickers Meadows, chief administrative officer at USPTO. 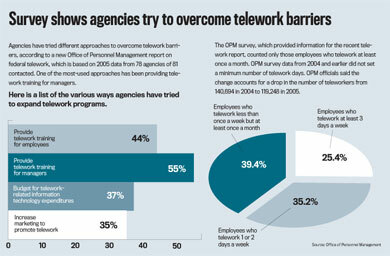 However, the biggest barrier to telework may be attitudes common in a bureaucracy based on office work. OPM found that 44 of the 78 agencies that responded to the survey did not know or keep track of the benefits of their telework programs. Click here to enlarge chart(.pdf).